Late this afternoon, we said goodbye to Haley-Grace. Her heart grew too tired for her to stay any longer, although I'm sure she wanted to stay. For the last 8 months, her foster mom, Cindy, has made life more beautiful for her than she ever could have imagined. And oh, how she deserved that. Because, you see, Haley viewed life as beautiful even when it wasn't. Back in April, Haley found herself in an animal shelter at 12 years old. But she made the best of her circumstance. Never have I seen, aside from Apple of course, a happier beagle while spending time in a shelter. You'd think she was living it up at a luxury resort. That's just how Haley viewed life. She always managed to find the positive side to everything. And then there was that other thing that made her name so fitting. She had such grace about her. Our Haley-Grace. Even as sick as she was, she still made the effort to greet the vet at the door with a friendly tailwag. I want to thank Beaches Animal Hospital for their excellent care of Haley-Grace. And I want to thank the mobile vet, Dr. Robert Curran of Houghton House Calls for his gentle spirit and incredible compassion today. And to Cindy, where do I begin with Cindy? She is a remarkable person and it's such an honour and privilege to have her as part of our Foster Team. Cindy loved Haley to the moon and back and Haley knew it. That's all that matters. Last but not least, I want to thank Haley herself. I never stop learning from these beagles and Haley taught me so much about that silver lining that is so easy to ignore if you don't take the time to look for it. All our love, Haley. You will be missed. We need your support. Ever since 14-year-old Haley-Grace was dumped by her family back in the spring because they wanted to travel, she has been ever so happy in our care. At least until this past Thursday when she had a very scary episode on a walk with her dedicated foster mom. Suddenly, she became very wobbly and fell over. There was no rhyme or reason to it. On Friday, she had yet another episode. We rushed her to our vets. At that point, it was not certain what caused these incidents. She was sent home with medication and we were to wait and see. But things got worse very fast. The episodes became more frequent. Something was terribly wrong. On Saturday afternoon, we rushed Haley-Grace to the Emergency Hospital. She is now in the ICU, hooked up to oxygen as she's unable to breathe on her own. Everything is pointing towards congestive heart failure. 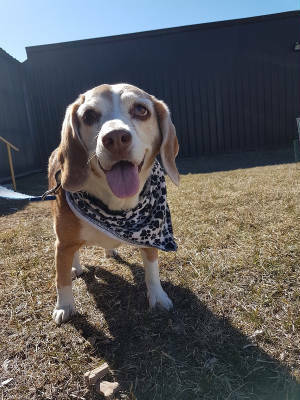 But up until Thursday, our Haley was a happy bouncy senior beagle. We are holding out hope she can be that again. The Cardiologist will be taking over first thing tomorrow. We'll know more by then. If she can be weaned off the oxygen and started on heart medication, she may have more happy years ahead. We've got to try, despite our financial crisis. She's part of our family and that's all there is to it. Of course, we know this might end badly and we may have to say goodbye to our precious Haley as we will not let her suffer. There must be quality of life. She must be able to return to that happy-go-lucky senior beagle. If she cannot, the right thing to do will be to let her go. But in the meantime, we're going to fight for her. Please, there is no such thing as a small donation. Every dollar counts. But we know we've asked for a lot of help this year. It's been a very costly year. So if you've already given all you can, that's okay. We understand. One way or another, we are going to get through this and we know you are right there with us. On behalf of Haley-Grace and every abandoned beagle that paws their way to our door, thank you. Because you mean more to us than we'll ever truly be able to explain. You might think that after all these years of running a Rescue, we would have grown a thicker skin by now. We've seen the worst side of humans time and time again. We see it in the eyes of all the abandoned beagles that wind up at our door. If anything, it seems to hurt more. Were it not for good people like you, we'd never survive stories like this. Our latest heartache is the beagle pictured here. We've named her Haley-Grace. If you look closely at the ground in front of her, you'll see an uneaten biscuit. It was the biscuit that did me in. Well that…and her story. But the fact that a beagle could ignore food (especially a cookie) had me in tears. There's only one thing more important to a beagle than food and that's love. She didn't want that biscuit. All she wanted was her family back. She doesn't know or understand why they left her at this animal shelter after almost 13 years together. But we know why. That's only because her owners answered the question in the Surrender Form they were asked to fill out. You see, they're planning on a lot of travelling in the future, visiting family, etc. It only made sense to drop their 12 years, 8 months & 19 days old beagle (complete with significant heart murmur, inflammed eye, possible Cushings, and suspected hernia) off at the local shelter so they could get on with their plans. How does anybody do that? We never get used to this. I suppose we never should.